The road from adolescence to adulthood is difficult and can become harder for some troubled youth struggling with personal issues. These personal issues can result in negative changes in behavior and attitude that, often times have an outcome of bad habits that will carry on into adulthood. Liahona Academy is a residential treatment center that has offered and given exceptional help to troubled youth who are struggling by providing effective therapeutic programs. Call Liahona Academy today at 1-800-675-8101 for more information about programs for troubled youth, including residential treatment centers. It can be hard for troubled youth and families of troubled youth to fully accept the severity of a situation. Teens have a hard time accepting help and parents just want to see their children grow as an individual and watch them succeed. However, it is important to realize that sometimes youth will make poor decisions that hinder this growing process and limit their potential. If you find that you child has started on a path that could possibility limit their potential to grow into a mature adult, the time to start seeking treatment is now. 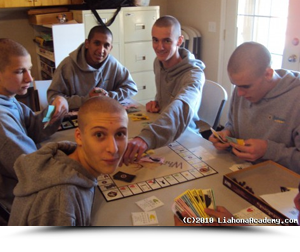 There are a vast amount of rehabilitation programs including boarding schools, military schools, residential treatment centers, wilderness programs, and boot camps. These programs have been designed to fit the needs of troubled youth similar to your child. All programs have different benefits and should be carefully researched and delicately chosen. Acting out during the adolescent time period is normal, but to an extent. When these struggles begin to show up with great consistency in teens, it is usually time to find help from specialized programs for troubled youth. Liahona Academy is a residential treatment center that helps troubled youth struggling with many different kids of personal issues. Residential treatment centers are some of the most successful rehabilitation centers because of the variety of programs that are offered to troubled youth. Troubled youth who visit our safe and secure environment leave with a better understanding of who they are, and their worth to those around them. Liahona Academy can help you and your child locate the correct program to best fit your situation. We have assisted in the recovery of troubled youth from all over and we are confident we can help you to the best of our ability. For more extensive information about programs for troubled youth, contact Liahona Academy today at 1-800-675-8101.